Economical yet powerful Sim Card Data Recovery Software is responsible for the retrieval of lost, corrupted, missed, deleted files and folders from mobile phone sim card. Sim (Subscriber Identity Module) card data retrieval software undeletes the deleted SMS (Short Message Service), erased contacts, contact number and phonebook entries or directory in minutes of time. 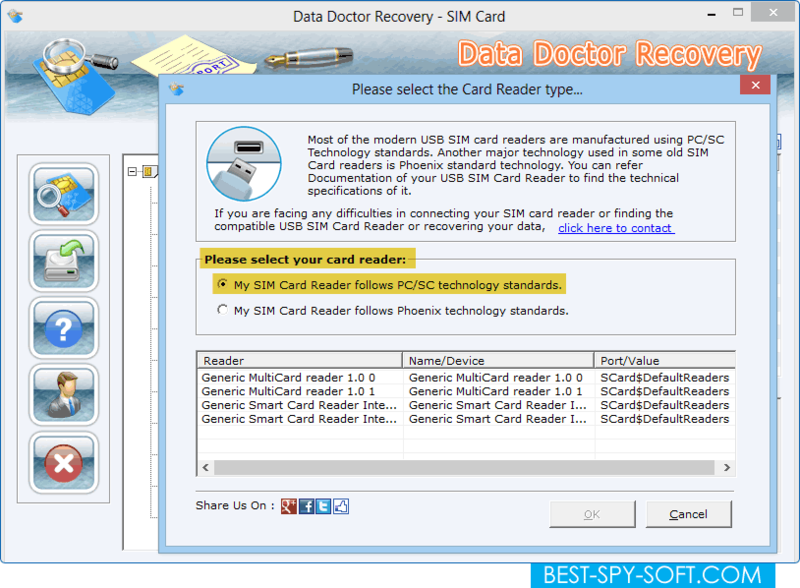 Deleted card recovery software reads the mobile phone sim card data with the help of USB sim Card reader (any PC/SC Standards or Phoenix Standards based Reader) and rescue all your sim card data including ICC number, IMSI etc with the facility of saving the recovered data at user specified location. Recover lost stored mobile phone sim card information in few minutes. Support recovery of both mobile phone sim card data. Entire lost text messages, contact numbers etc can be easily and quickly recovered with date and time. Provides option to deliver log file details at set time interval to user specified email address. Provide details including identification number, Sim IMSI number, mobile model number using sim card recovery tool. The recovered data can be restored at user specified location for future reference. No technical assistance is required, even a layman can easily operate the software.